American Federal Buys And Sells Rare Coins! 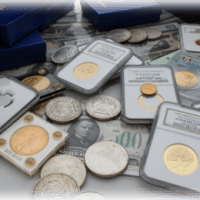 For nearly 40 years, American Federal Rare Coin & Bullion has been serving buyers and sellers of rare coins. We carefully monitor the market to stay one step ahead of our competition, ensuring we’re able to secure profits for clients just like you. We don’t want to limit your options in the coin and bullion market, either. That’s why we don’t just sell. We also buy, trade, and consign!